After a long and week of solo parenting, I got back to the studio this morning, hoping I was ready to get in some serious painting time after multiple schedule derailments last week. [After a nap on the blue couch,] I got set up to paint some blossoming leaves from a nearby tree… I was hoping to capture the sense of newness and hope that are encapsulated in the colors of this seasonal moment. The result is disappointing. Bowed but unbroken, I tried a second one, which ended up even muddier and even less joyful. What is so difficult about capturing these very simple shapes? I’m honestly not sure. But maybe this is the sign that I should just focus on process and not worry about product for a bit, try to figure out how to these shapes. 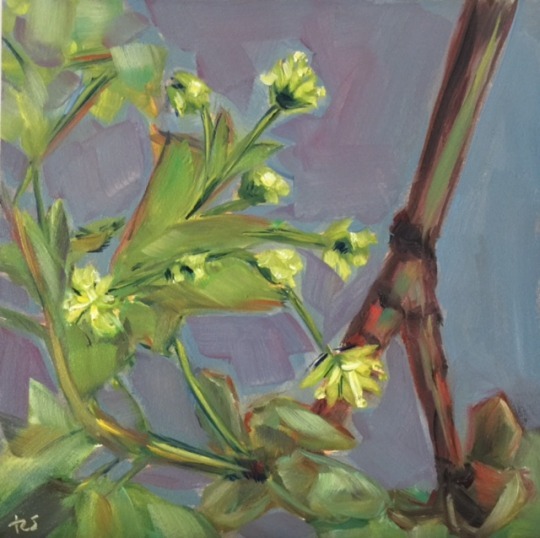 Even though I know I don’t want to paint blossoms forever, I do want to feel like I can paint whatever I set my mind to – and not have certain subjects (n this case, flowers or all types!) seem off limits. I am pretty sure that a lot of the trick is figuring out how to clearly understand what I am seeing so that I can translate that more clearly to rendering. Those are skills and experiences that should translate through many different efforts.